Arsenal have allegedly earmarked Paris Saint-Germain midfielder Adrien Rabiot as their top summer transfer targets. The France international was widely expected to leave Parc des Princes during the January transfer window, having refused to sign a new deal with the Parisians. The 23-year-old ultimately remained in the French capital beyond the January deadline, but his current contract will expire this summer and a number of heavyweight clubs have been linked with a move. 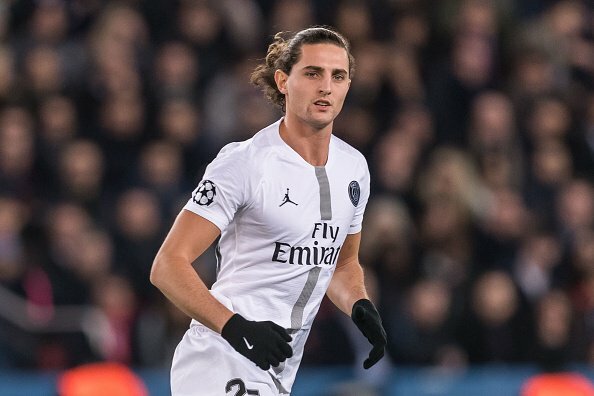 According to The Mirror, Arsenal manager Unai Emery is a huge admirer of Rabiot, having worked with the playmaker during his time in charge of PSG. The report adds that the Gunners are closely monitoring the rise of the midfielder and are hopeful of beating the likes of Barcelona, Tottenham Hotspur and Liverpool to the player’s signature this summer. Rabiot has made 20 appearances in all competitions for the Ligue 1 champions this season.